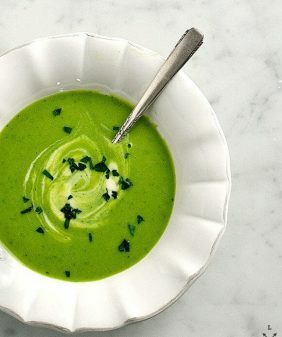 I love the simplicity of this spicy green soup. Just simmer a paste of fresh herbs, ginger, chiles & almonds, and you have a piping hot, cleansing meal. I’ve made this soup three times in the past week and a half. I know – it’s not quite soup season yet, but you probably still have bunches of summery herbs, and this recipe is such a wonderful way to use them. This one comes from Heidi Swanson’s book Near and Far, which has been a favorite in my kitchen since it came out last fall. I just love Heidi’s recipes because they’re so unique and usually very simple to put together. This one takes no longer than 15 minutes, and it packs a bright punch of flavor. 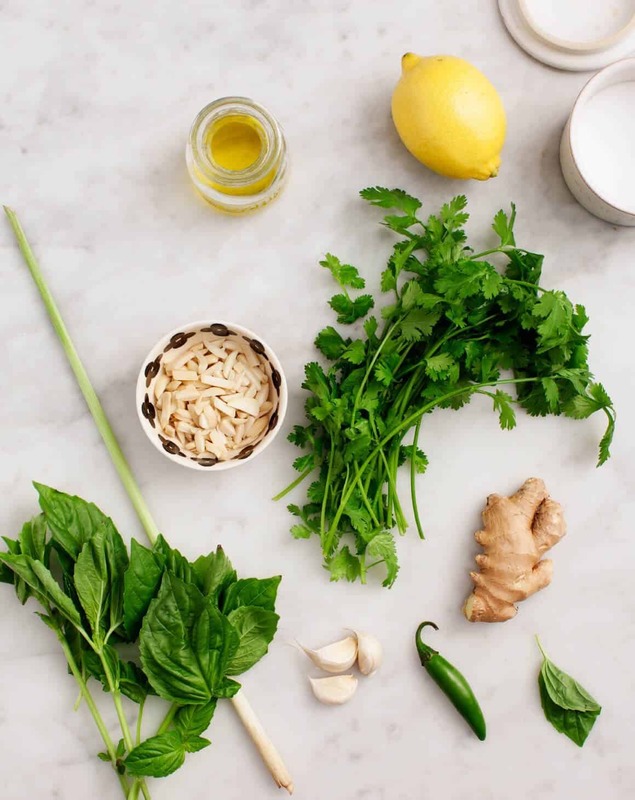 Basil, cilantro, ginger, almonds, lemon… all my favorite things. 🙂 The only slight change I made to the recipe was using lemongrass instead of mint because it’s what I happened to have on hand. 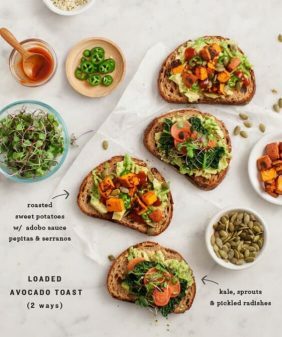 This recipe is such a great base for whatever toppings you want to add – see Heidi’s suggestions in the recipe below. The first time, I added brown rice and sliced almonds, the second time a poached egg (heavenly), and this time – soba noodles, green onions, and tofu. 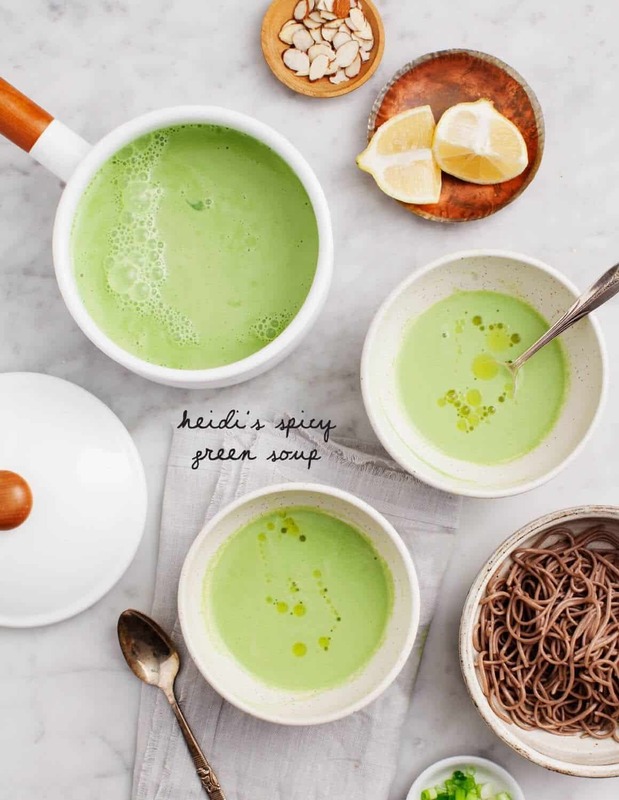 The book is organized into two sections: recipes that are inspired by Heidi’s home (in Northern California), and those that are inspired by her travels to places such as Morocco, India, Italy, France, and Japan. I’m so drawn to this book because we’ve traveled to many of the same places, and I just love the way she translates these cuisines so simply and beautifully. All the recipes, by the way, are vegetarian. Next on my list is to try her Pozole recipe, how gorgeous does that look? 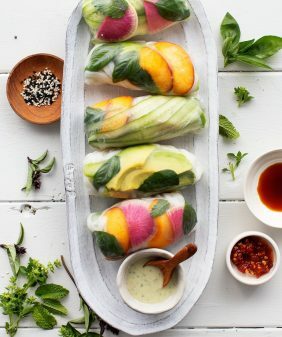 Recipe from Near and Far by Heidi Swanson. Reprinted with permission. In a saucepan, bring the water just to a simmer. 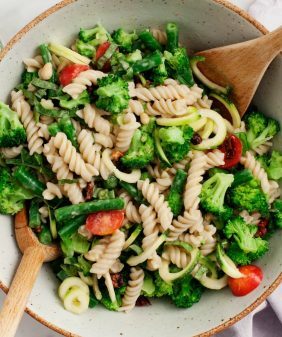 As the water heats, combine the garlic, basil, cilantro, mint, ginger, olive oil, chiles, almonds, salt, lemon zest, and honey in a blender or food processor. Process for a couple of minutes, thinning with a couple of tablespoons of cold water and scraping down the sides along the way, until the mixture becomes as smooth as possible. Taste and adjust to your liking the paste should taste strong and spicy. Just before serving, add the paste to the simmering water and stir well. Dial back the heat at this point; you don't want it to return to a simmer, but you do want it very hot. Taste and adjust the seasoning - a bit more salt or a squeeze of lemon juice. 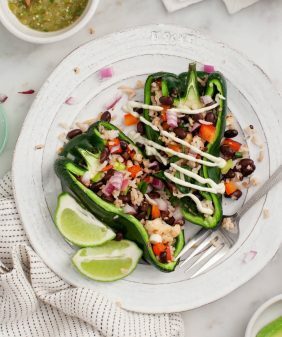 Ladle into bowls with your chosen accompaniment, and enjoy on its own or topped with any of the suggested toppings. 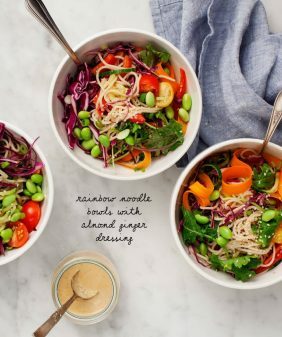 Looks delicious and efficient – I like the addition of the soba noodles and know my soup girl will be all over this one (my daughter eats soup year-round). You will love Pozole if you’ve never had it~ a definite favorite! This is so unlike any soups I’m familiar with. We have soup every Tuesday in winter, so this will be an interesting change of pace. I can’t wait to try it! If you want to split up the servings should you make it fresh hot water each time or can it be reheated? I think either way would work – I reheated mine. It separates, but just give it a stir and it’s fine. I feel the same about Heidi’s cooking and her approach to other cuisines. All of her recipes are so uniquely and beautifully Heidi I could pick them out anywhere in the world. I’m drooling over your latest version of her green soup. Definitely my favorite version. Have got to try! Made this lovely soup and topped it with soba noodles, white beans, and avocado. Seriously delicious! I need to get this book. I love the way you presented the soup and you definitely convinced me to try it. I was inspired by this recipe and was also trying to figure our what to do with a daunting amount of garden zucchini. I made the herb puree without the almonds and added it to a pot of cooked zucchini chunks and then put it in the blender. Yummy! Thanks for helping to solve my abundance of zucchini! This soup looks BEAUTIFUL I love the bright green color! Did you blanch your basil first? My paste was not such a pretty green color. no, I use it raw and mine turned out very green. I guess it could have been because I used less oil and a bit more water, but otherwise I used all the same ingredients. the only thing I can think is that it’s possible that I added more herbs. I find it difficult to measure “packed cups” of herbs so I just eyeballed it. Thank you for sharing the recipe. I used it like a salad dressing tonight tossed with lettuce, kale, orzo and tofu. grocery store basil (around here, at least) is often dark green, and not so brightly colored. I tend not to use it for pesto, as a result. I’m going to save this recipe until we get fresh local basil! I made so many dishes from your cookbook and blog, but this one didn’t turn out good. I must did something wrong, it tasted and looked like fresh mowed grass with a dash of mint. feeling in the mood for healthy soups after indulging a bit over the holidays! Got your vegetarian green spicy soup on my list of things to try. thank you for sharing. Yum. Ginger, garlic, lemon and all those herbs in the recipe make it so appealing. Can’t wait to make it. I’m thinking of trying roasted mushrooms with it. my family members are allergic to garlic. Are there any substitute for it?